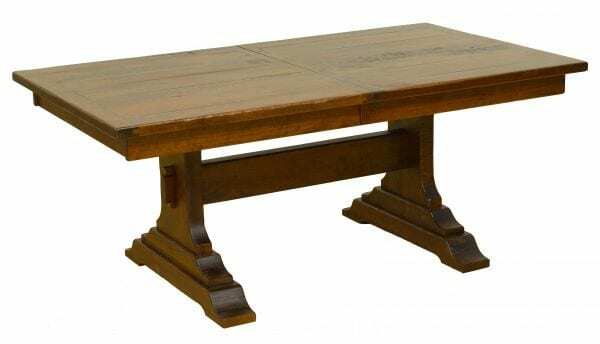 42″ x 72″ McKinley Trestle Table shown in Rustic Cherry. Standard Features: Mission top, 1 1/2″ thick plank top, breadboard ends on table and leaves, 18″ leaves, 3 1/2″ wide skirting, 1/4 round edge, double equalizer slides, self-storing leaves, McKinley trestle base, distressed, low sheen finish. Available in sizes: 42″-48″W x 54″-72″L (6″ increments). Leaves: Up to 2.